"A richly-written novel of strange happenings in 17th century England"
“Don’t tell her what it was like. Don’t tell her how you had to dig your way out through heavy layers of clay to reach the fresh air, because that would distress her. Don’t tell her about the box, because that would confuse her. Newtons Sleep has not been tagged yet. 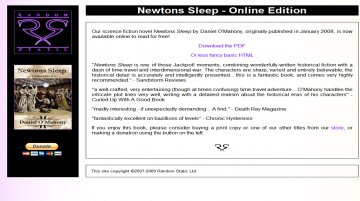 Help others find Newtons Sleep by tagging it! Newtons Sleep has not been reviewed yet. Newtons Sleep has not been recommended yet.